Chinese fruits are seen on sale at Hoc Mon wholesaling market in Ho Chi Minh City December 8, 2013. It is easy to explain why Chinese imports are flooding the Vietnamese market: they can be delivered quickly, in huge quantities, and at dirt-cheap prices. While agriculture is Vietnam’s economic strength, the sector is now also full of produce imported from China, not to mention a heavy reliance on Chinese machinery, seeds, and fertilizers. Vietnam spent some $40 million to import up to 15,000 tons of rice seeds from China every year, according to the Department of Cultivation. This is equal to the value of exporting 100,000 tons of high-quality rice. The country also imports a huge amount of fertilizer from China, with the total import turnover in the year to October topped $703.4 million for 2 million tons of fertilizer. Fruit and vegetable imports from China to Vietnam slowed down in the second quarter of this year, following news of several food scandals unearthed in the country. But the volume of Chinese produce exported to VN has returned to its normal track in the last months of the year, with wholesalers revealing that Chinese produce like carrots, pumpkins, and cabbage are arriving in Vietnam in huge quantities on a daily basis thanks to reduced prices. While Chinese carrots fetched VND3,800 a kg in May, prices dropped to only VND2,500 a kg in October. Meanwhile, cabbage prices slumped 48.5 percent from earlier this year to only VND1,700 a kg. “Import prices slumped while selling prices on the market remain unchanged or even increased, enabling traders to rake in greater profits,” said Cuong, a wholesaler at the Tam Binh agriculture wholesaling market in Thu Duc District. Chinese produce has managed to re-penetrate Vietnam, taking advantage of the fact that prices of produce imported from Thailand, New Zealand, and the US strongly surged in the third quarter. 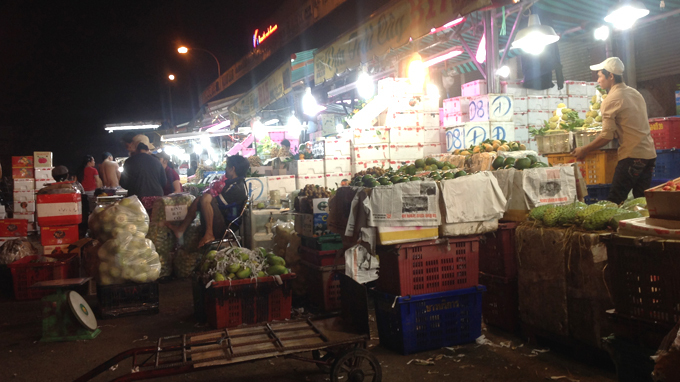 The wholesaling market of Hoc Mon is always busy, even at 1 in the morning. At 1am, container trucks arrive at the market and traders immediately rush out to unload myriad of cartons containing citrus fruits, pears, and apples. On the cartons are labels covered with Chinese characters. “Each container truck will unload at least 100 – 300 cartons at each booth in the market,” Ngoc, a wholesaler, said. There are traders who source as many as 1,000 cartons per night, but all wholesalers here manage to sell their goods by morning. Each fruit carton weighs 8kg, some of which must have been frozen months before being exported to Vietnam. The distributors also make it faster to transfer the produce to the Mekong Delta. “While traders from the Mekong Delta have to come to wholesaling markets in HCMC to source the fruits, the container trucks now also come to the delta, reducing the transporting cost,” a wholesaler revealed. Chinese goods thus continue to win the market in the Mekong Delta, and are now rampant in the area.